It’s FREE CONE DAY on Tuesday, April 9 at OC's only Ben & Jerry's shop at The District at Tustin Legacy. More than 6,000 ice cream lovers are expected to turn out from noon to 8 p.m. for the annual event. The lines may get long, but they move fast and there will be a DJ playing music for the crowds and giving out front-of-line passes, as well as a balloon-artist for kids -- all free. And, if one scoop isn't enough to satisfy, folks are allowed to get back into line for an additional scoop. Last year, the OC Ben & Jerry's gave out 6,290 free cones -- the most popular scoops doled out? Chocolate Chip Cookie Dough, Sweet Cream N Cookies, Chocolate Fudge Brownie and Vanilla. There will be options for vegan and dairy-free fans as well, including Caramel Almond Brittle and non-dairy Chocolate Chip Cookie Dough. There will also be a lower-calorie option with Mocha Fudge Brownie, from Ben & Jerry's Moo-phoria's line of light ice creams. The iconic ice cream brand has held its Free Cone Day event since 1979 and they expect to give away more than 1 million free cones this year from more than 500 scoop shops around the world. Ben & Jerry's is located at 2459 Park Ave., Tustin, at The District at Tustin Legacy. It's located next to AMC Tustin 14. 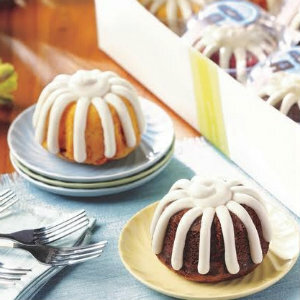 And, there are more sweet freebies on Tuesday, April 9: Nothing Bundt Cakes will be heralding the opening of its 300th bakery. To celebrate the milestone, from 3 p.m. to 3:05 p.m. (five minutes or 300 seconds), every NbC bakery in the country, including The District's location, will be giving out a free Confetti Bundtlet. Staff will be handing out tickets for free Bundtlets at 3 p.m. until all 300 tickets are given out. Nothing Bundt Cake is located next to Halal Guys, near Ulta Beauty.